What is Cthulhu Mythos Anyway? For years now, I've come across this phrase, Cthulhu Mythos, but never the definition. It must be one of those things everybody knows. Authors have been using it in articles and blog posts, often, but they've never taken the time to define it and, me being too lazy, I never bothered to research it. From what I gathered, it's a creature and it has something to do with Lovecraft. Let's get the important stuff out of the way. I've never heard anyone say Cthulhu so I have no idea how to pronounce it.... How fun. Dictionary.com has a definition but no pronunciation. I love dictionary.com but this has to be the least helpful definition ever. The term originated from "The Call of the Cthulhu" by H.P. Lovecraft. I read the story long before I knew about Cthulhu Mythos. So, looked at it again with the mythos in mind. First of all, I've read only two authors who could pack a story full of adjectives and make it work- Edgar Allen Poe and H.P. Lovecraft. This story was so much fun to read. I had to break out my journal and take notes. The way he uses words is brilliant. 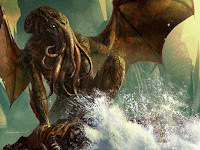 So what is a Cthulhu? "It represented a monster of vaguely anthropoid outline, but with an octopus-like head whose face was a mass of feelers, a scaly, rubbery-looking body, prodigious claws on hind and fore feet, and long, narrow wings behind. This thing, which seemed instinct with a fearsome and unnatural malignancy, was of a somewhat bloated corpulence, and squatted evilly on a rectangular block or pedestal covered with undecipherable characters. In layman terms, it's a creature with an octopus face and bat-like wings. In other words, there is no one way to pronounce it. By the way, Cthulhu has to be the hardest word to type. Understanding this turned out to be a bigger undertaking than I thought. Cthulhu Mythos is not something you can explain in a couple of words. In order to really understand it, you need to do some significant research. I had more fun researching this than I expected. It's still amazing how a work of fiction, something that isn't real, can have such an impact on real life. It reminds me of a study I read last year. It's really easy to get hung up on research when you see things commonly referred to by fans of a particular world. In my RPG world, I slowly became accustomed to the terminology I'd never been familiar with, and then once I'd gotten accustomed, everywhere I went in the RPG world, it's the language I'd hear. I've never heard of this. I've seen creatures with octopus faces before but never with bat wings. Very interesting. I heard about it a few months back, the Lovecraft concept. I'd heard of the beast before, but for some reason I thought it might be a comic book concept and nothing more. The Cool Air was recently produced, based on the HPL story of the same name. There have been many films, and yes, comic books too, as well as video games (Cthulhu Dark Secrets of the Earth), trading card games, pen and paper roleplaying games and...yes even music. Bands like Metallica and Cradle of Filth have done songs like Kthulhu Dawn. 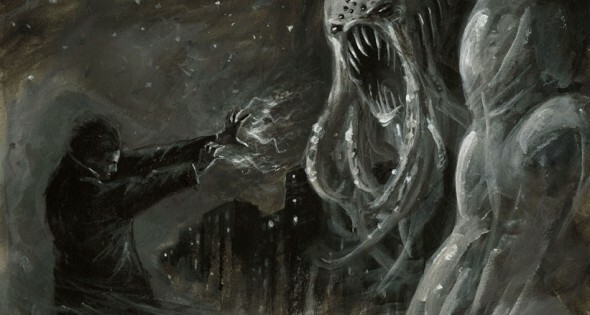 Del Toro has been dreaming of doing At The Mountains of Madness as a film for many years, but he was put off by Prometheus because the film hits on many of the themes, and what he wanted to do. And dont be ashamed of hearing things for the first time. 10,000 people do every day.